So, unless you’re living completely off the grid, a certain movie came out a few weeks ago, and I was SUPER excited to see a lot of super heroes hitting things. Okay, so maybe I’m over simplifying the new Avengers movie because OH MY GOODNESS what a movie! So much happened in that 2 hours and 40 minutes, and there is still so much to happen in Part 2! I had so many different feelings throughout the movie, but I won’t get into specifics, because, spoilers. 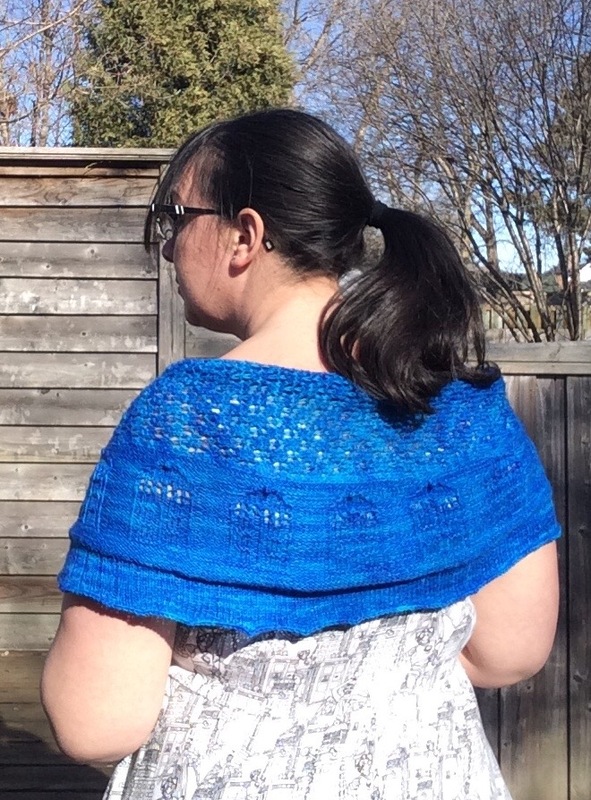 Quite a bit went into the making of this shawl: the yarn was all hand dyed, it was my first time trying beading, and the cast off involved casting off over 1500 stitches using the Jeny’s Stretchy Bind Off method. When I was around the one-third mark, I messaged a friend and asked her to send either help or vodka. Casting off really was a test of patience, but totally worth it. As well, I faced yet another instance of not paying attention to required yardage. One would think I’d learn my lesson, and this one hurt. All of this yarn was hand dyed, and when I was about to start the second red stripe, I realized rather painfully I wouldn’t have enough yarn to finish it. Did I mention it was hand dyed?? 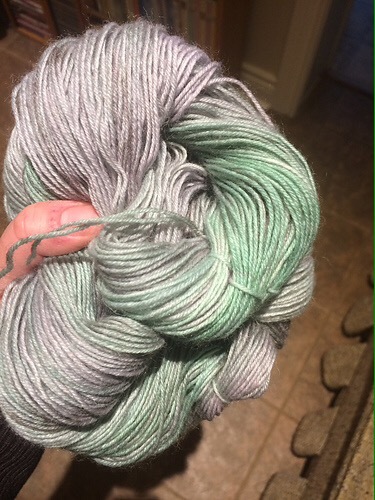 I was able to dye another skein, and I was pretty impressed at how close I was able to get the colours! 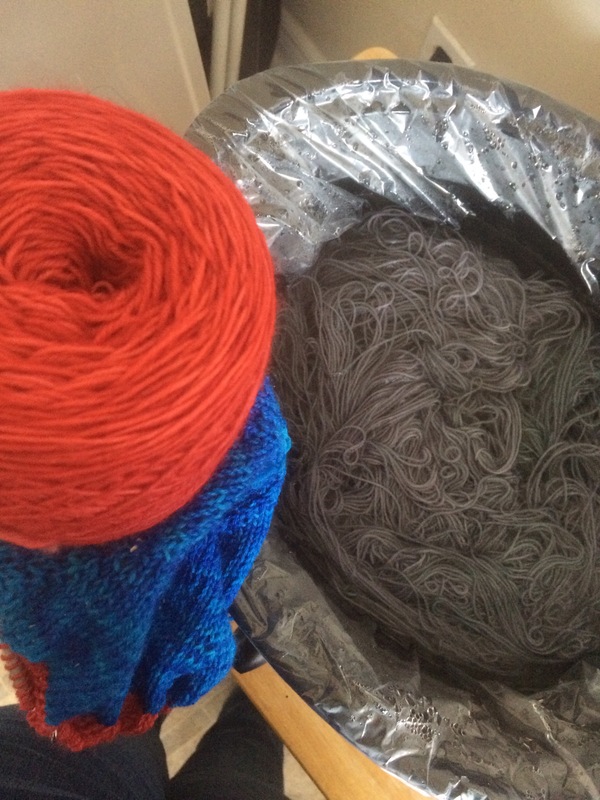 In the picture above, the original skein is on the right, already caked and almost half used, and the newly dyed skein in on the left, waiting to be wound. 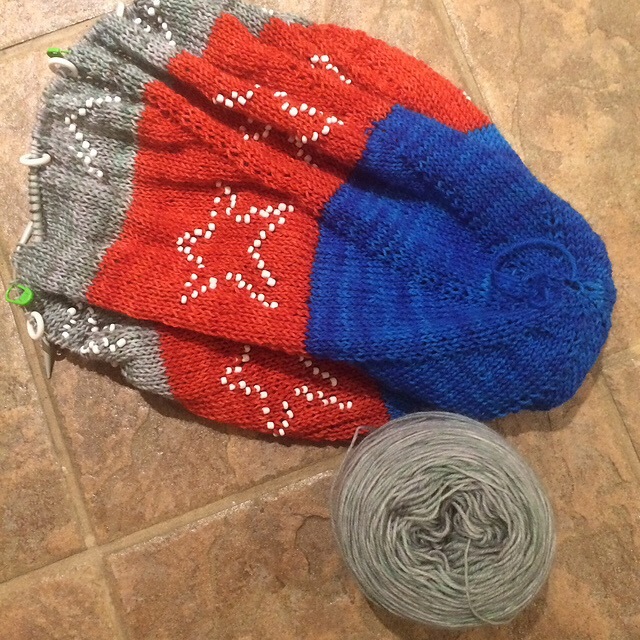 When it came to knitting the final red stripe, I blended the two colours, alternating skeins every row. Seriously folks, pay attention to yardage. I have to add, I’m kinda loving this designer. 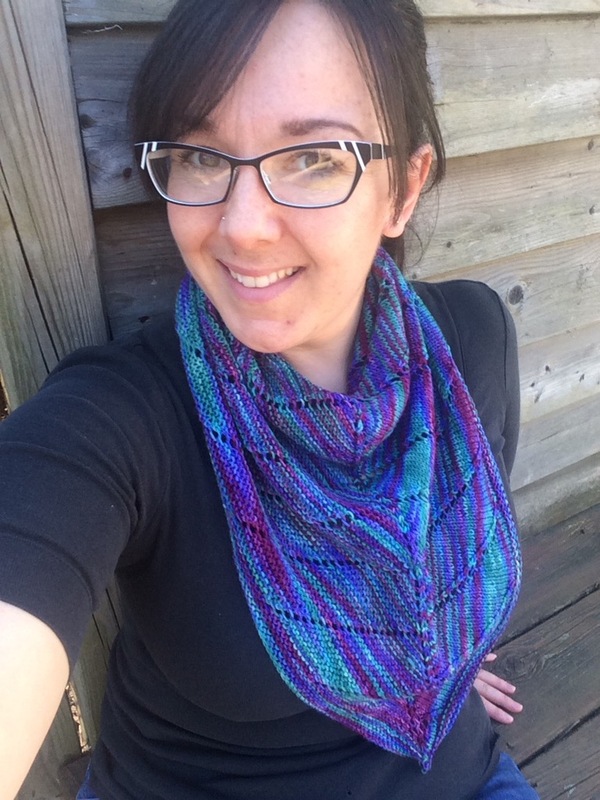 Lalíe Roque has five patterns available FOR FREE on Ravelry, and all three relate somehow to a fandom. Right before Avengers Part 1 came out, she released a new pattern: a pair of fingerless gloves designed in the style of Thanos’s gauntlet which holds the infinity stones. I’d highly recommend checking out her designer page on Ravelry because I am simply inspired by her creativity. Maybe I’ll make the gauntlets before Part 2 is dropped. Author LTerechPosted on May 7, 2018 May 1, 2018 Categories KnittingTags captain america, geeky, hand dyed, knit, Knitting, Marvel, pattern, project, projects2 Comments on ASSEMBLE! 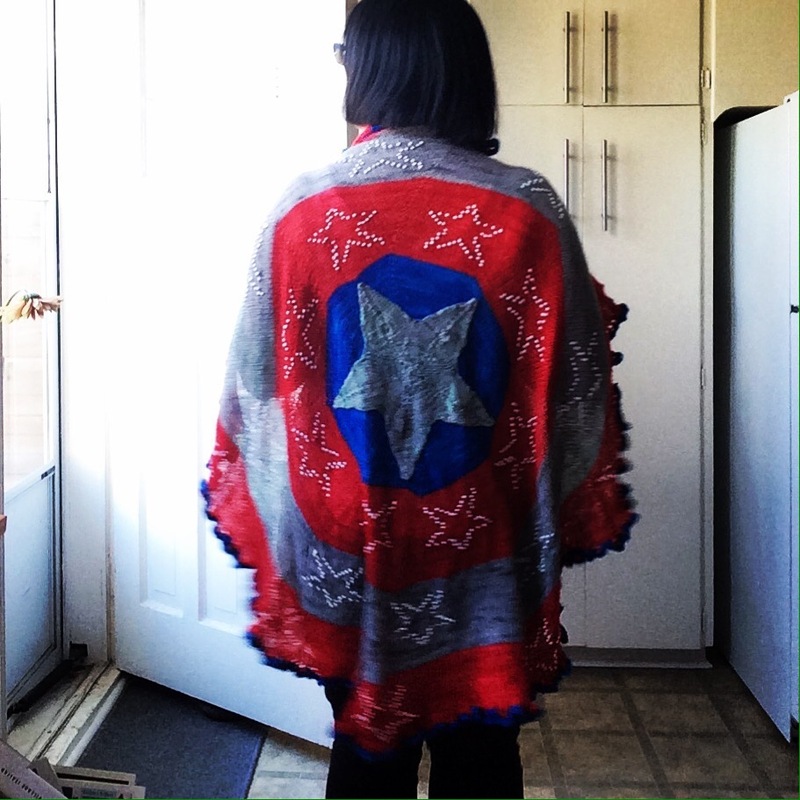 I’ve made good progress on my Captain America shawl. I’ve been working away at it, row by row and bead by bead, all the while watching any Marvel movie available on Netflix. I truly thought it would have taken far longer than it’s seeming to right now, but I’m happily watching the progress take place. The yarn, as I explained last week was all hand dyed. The grey finished with steaks of mint green throughout, a result of the black I used for dye breaking, and after receiving encouraging comments from a Ravelry group, I decided to keep it as is. The green isn’t bothering me nearly as much as I feared it would at first glance. The most challenging part of the shawl has been the beading, as this is a new technique for me. Like with all new things, at first it felt like such a foreign motion, but after over 300 beads, muscle memory starts to form and progress got faster. The beads are adding a lovely weight to the shawl, and I’m just excited to see it taking shape. That I get to re-watch any Marvel movie I can get my hands on, well that’s just an added bonus.